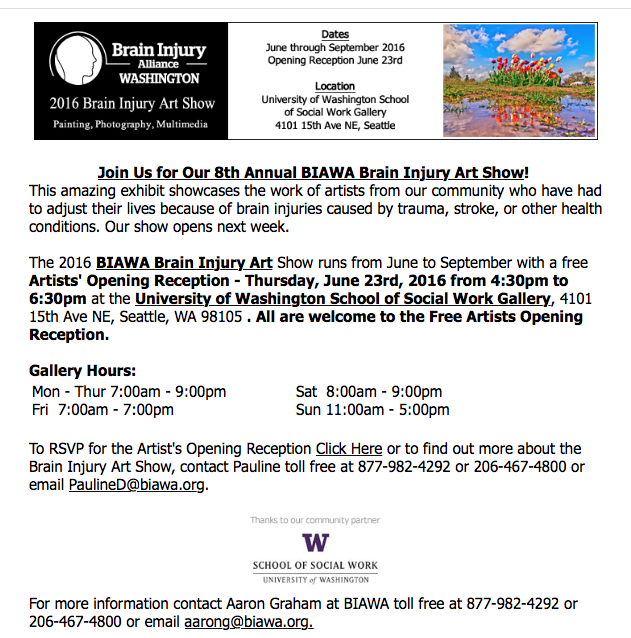 Join BIAWA for their 8th Annual Art Show! Opening night is June 23 and runs through September 2016 at the University of Washington. RSVP Here! This entry was posted in Uncategorized and tagged art, BIAWA, brain injury, disability, free, Seattle, Washington on June 21, 2016 by Desiree. 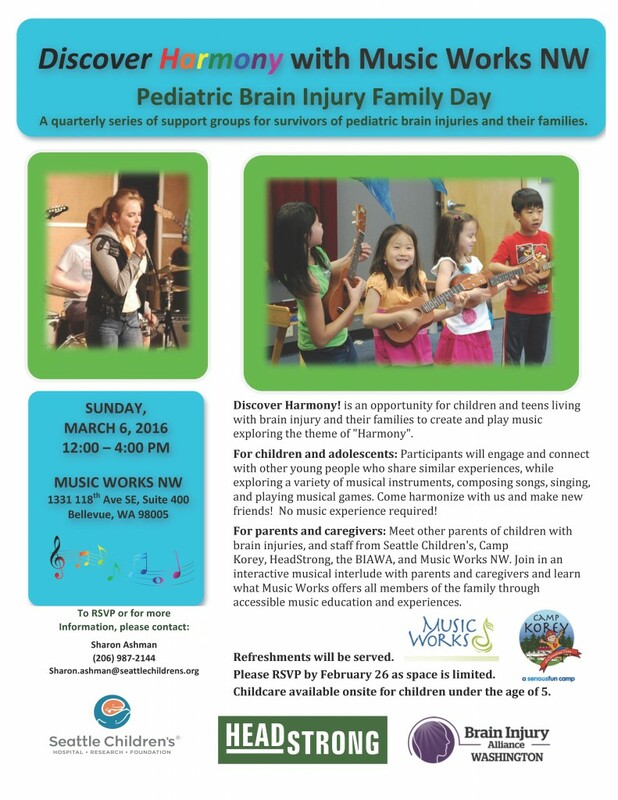 Join us for Adaptive Bicycle Day with Outdoors for All, Sunday May 22nd! We had a blast last year’s event with so many different types of bicycles to fit every accessibility need. 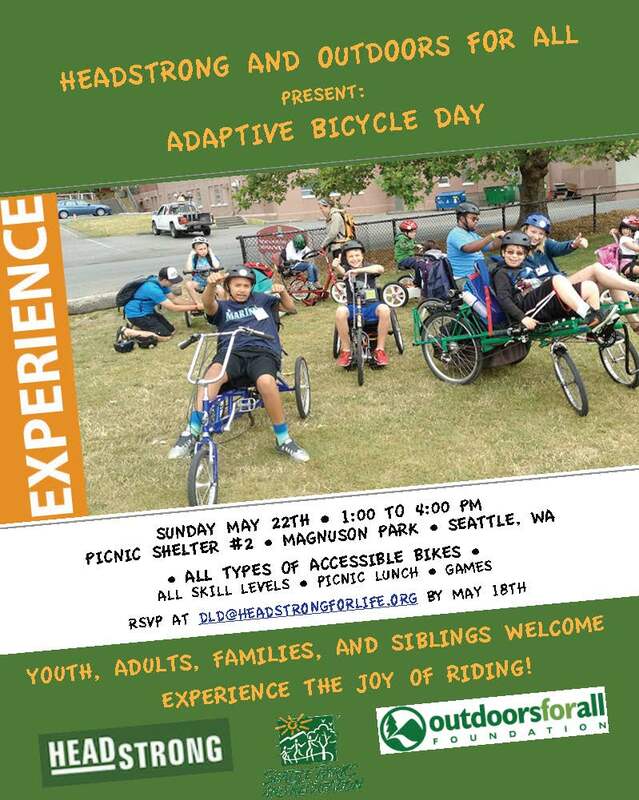 Bring the whole family for a day of riding, picnic lunch and fun at Magnuson Park! This entry was posted in Uncategorized and tagged accessible bicycling, accessible sports, brain injury, brain plasticity, disability, free, HeadStrong, luncheon, Magnuson Park, mentors, neuroplasticity, Outdoors for All, outdoorsforall, pediatric, Seattle on May 11, 2016 by Desiree. 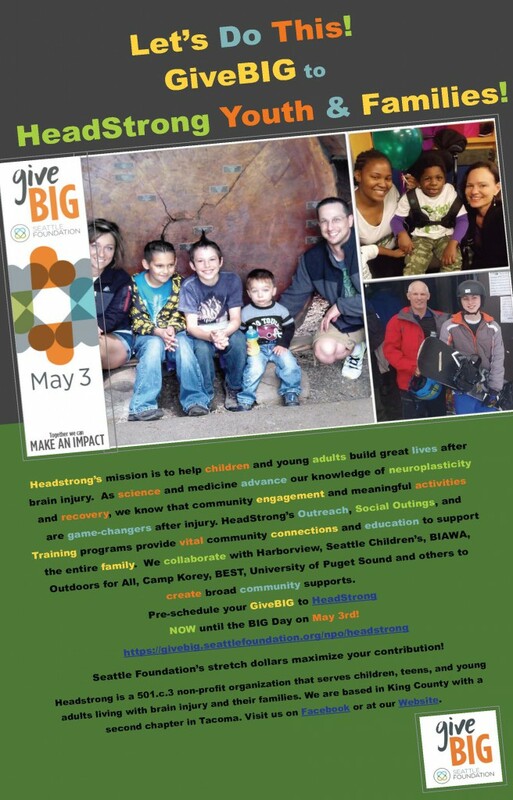 GiveBIG to HeadStrong – Now to May 3rd! NOW until the BIG Day on May 3rd! 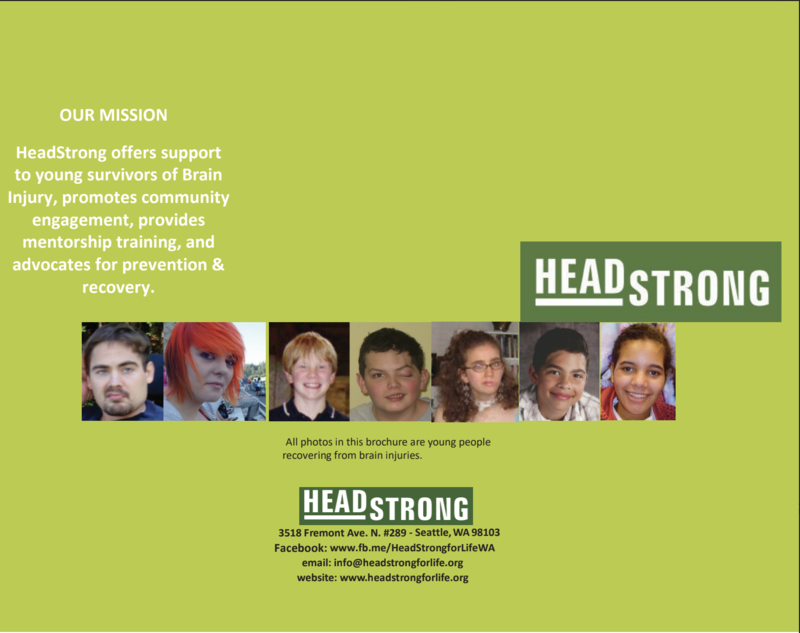 Headstrong’s mission is to help children and young adults build great lives after brain injury. 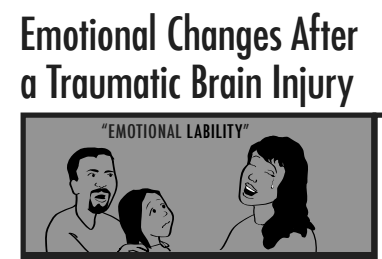 As science and medicine advance our knowledge of neuroplasticity and recovery, we know that community engagement and meaningful activities are game-changers after injury. 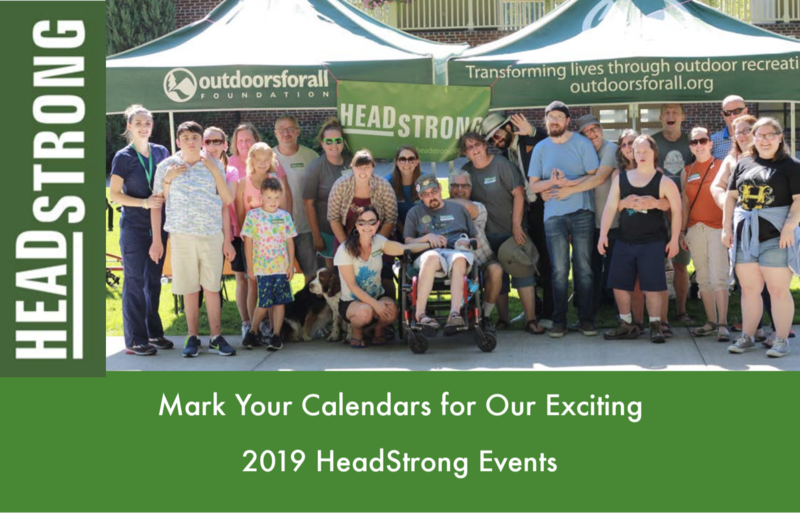 HeadStrong’s Outreach, Social Outings, and Training programs provide vital community connections and education to support the entire family. We collaborate with Harborview, Seattle Children’s, BIAWA, Outdoors for All, Camp Korey, BEST, University of Puget Sound and others to create broad community supports. Headstrong is a 501.c.3 non-profit organization that serves children, teens, and young adults living with brain injury and their families. 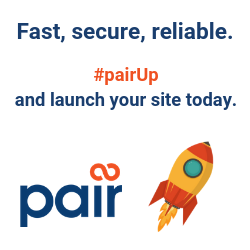 We are based in King County with a second chapter in Tacoma. 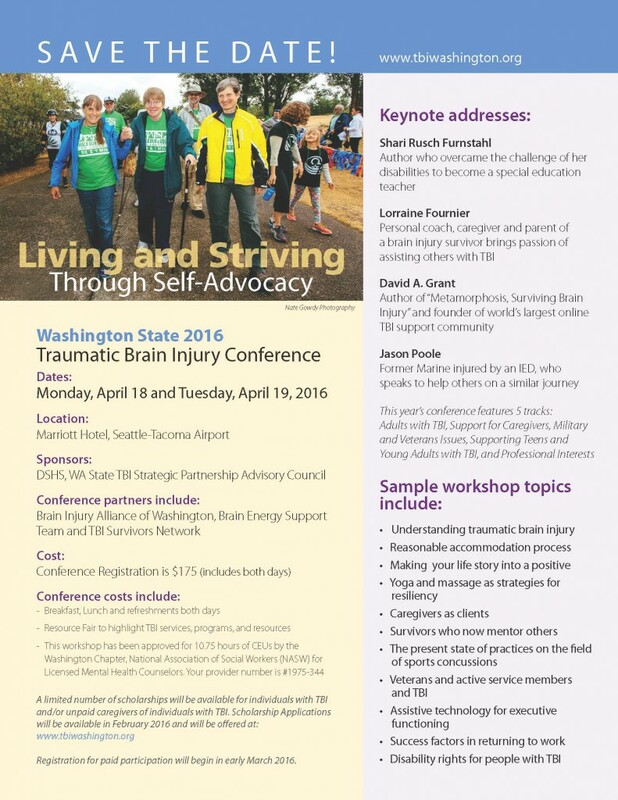 This entry was posted in Uncategorized and tagged accessible bicycling, accessible skiing, accessible sports, brain injury, brain plasticity, free, fundraiser, mentors, neuroplasticity, pediatric, respite, Seattle, social identity, tbi, TBI Conference, training, Washington, youth on April 28, 2016 by Desiree. 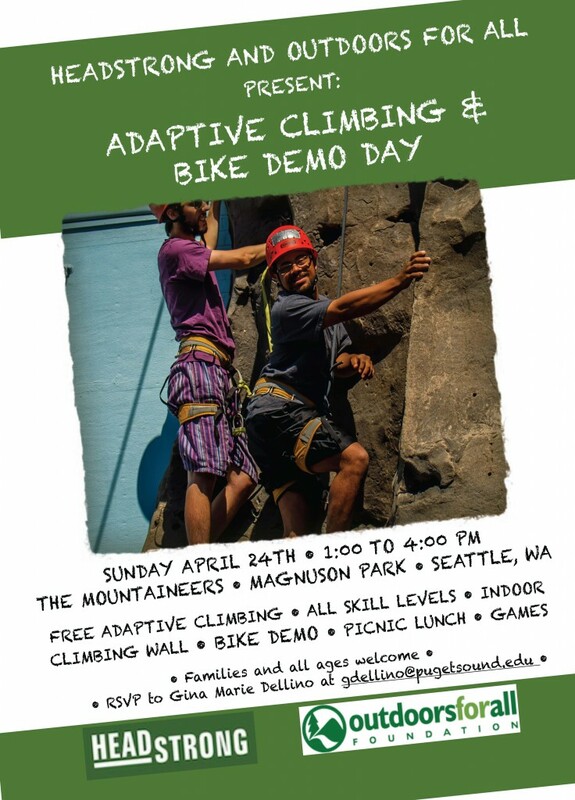 RSVP TODAY for Adaptive Climbing and Bike Demo with HeadStrong & Outdoors for All! Just a couple days left to register for Adaptive Indoor Climbing and Bike Demo Day with Outdoors for All and HeadStrong! RSVP TODAY to Gina Dellino at gdellino@pugetsound.edu. Click Here to see Photo Album of Adaptive Climbing Day on our Facebook page. This entry was posted in Uncategorized and tagged accessible sports, brain injury, brain plasticity, disability, free, HeadStrong, Outdoors for All, outdoorsforall, pediatric, Seattle, tbi, Washington, youth on April 21, 2016 by Desiree. 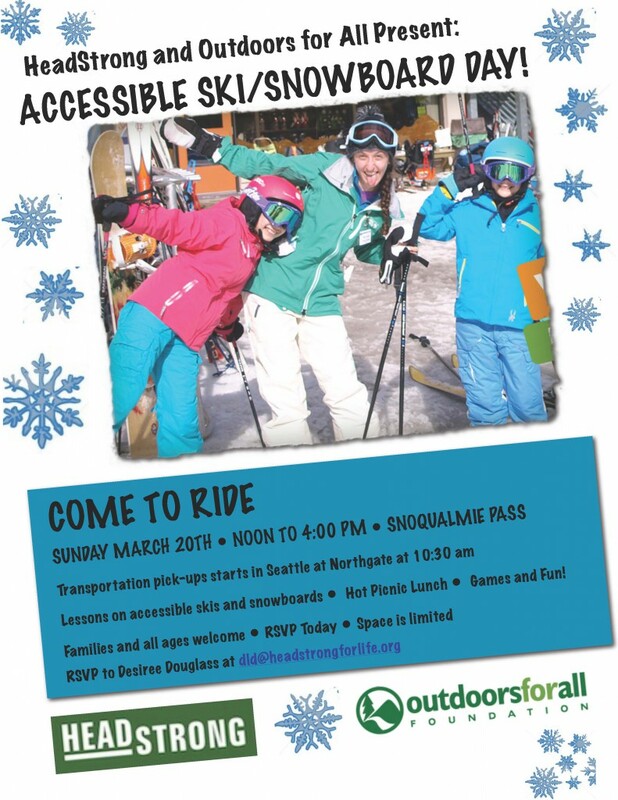 This entry was posted in Uncategorized and tagged accessible skiing, accessible snowboarding, accessible sports, brain injury, camps, free, HeadStrong, Outdoors for All, pediatric, Seattle, Summit West, tbi, Washington, youth on February 26, 2016 by Desiree. APPLY TODAY FOR FREE CAREGIVING RESPITE!! 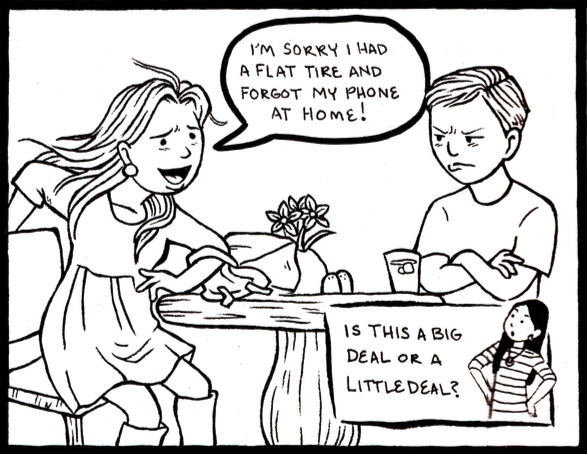 You are an unpaid “family” caregiver if . . .
You provide care or support for an adult or child with a chronic or condition that prevents self-care. You may even be a family member, friend, or neighbor. Your family member needs support with activities of daily living. You are not “paid” to support your family member. (Yet for those who are able to receive some financial support, it does not mean they are compensated adequately for their help. They may even have to give up earning an income in order to provide the care needed. Even though you have made a decision to help your spouse, parent, child, or other loved one, we understand it can take a lot of time, effort and work. You may have become a caregiver suddenly and without warning, or perhaps your role evolved slowly over time. It can even be mentally and emotionally challenging as you balance their needs with your own. We acknowledge sacrifices you have made. You matter: Clearly, your loved ones need you. And your daily work saves our State billions of dollars every year. 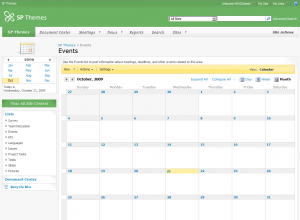 You deserve an occasional break to help you in your important role. You deserve RESPITE. This entry was posted in Uncategorized and tagged brain injury, caregiver, disability, financial, free, respite, Seattle, Washington on February 26, 2016 by Desiree. 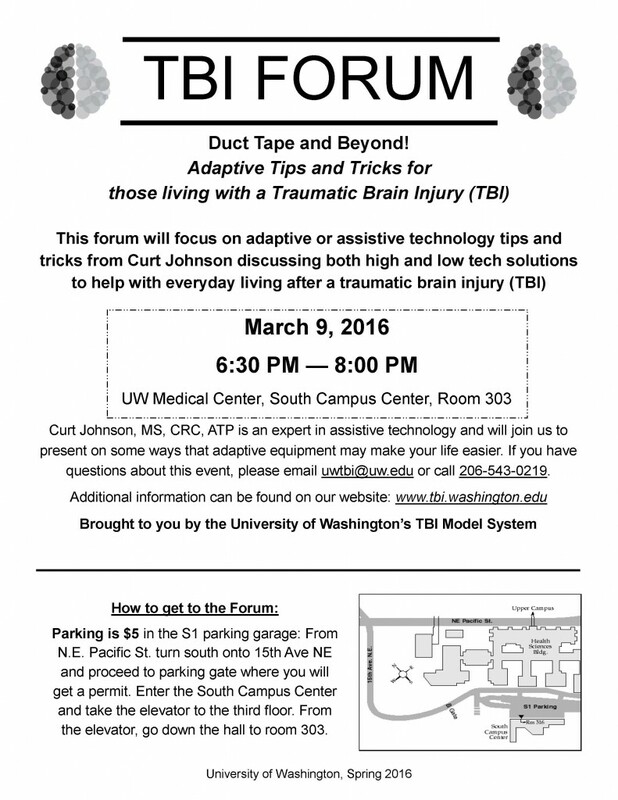 This entry was posted in Uncategorized and tagged brain injury, caregiver, disability, neuroplasticity, Seattle, TBI Forum, TBI Model System, training, University of Washington, Washington on February 26, 2016 by Desiree. 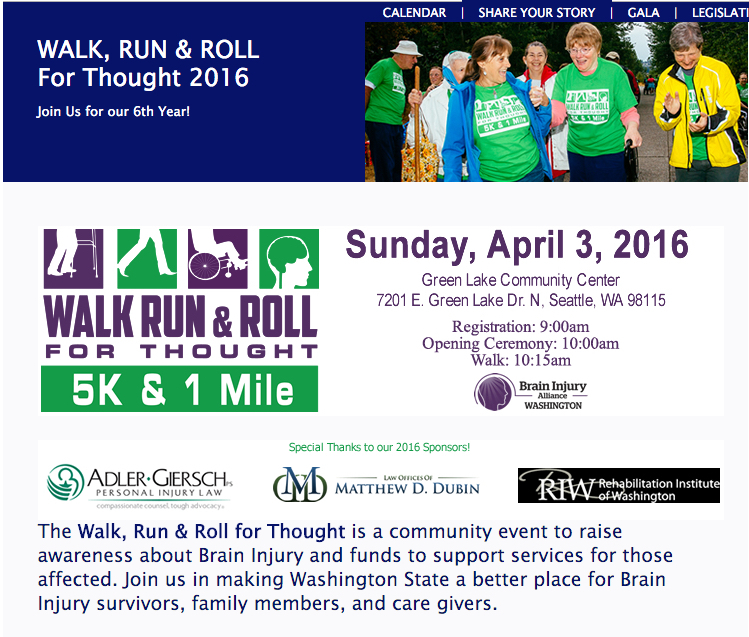 BIAWA’s 6th Annual Walk, Run & Roll for Thought is just a month and a half away on Sunday, April 3rd! Join us at Green Lake for a morning of celebration and awareness. This entry was posted in Uncategorized and tagged accessible sports, BIAWA, brain injury, fundraiser, walk, Washington on February 26, 2016 by Desiree.